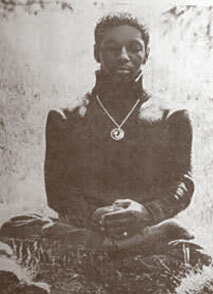 New York City Photographer, Foster Henry, took this photograph of Vernon Kitabu Turner (Kitabu Roshi) in 1973 when they were both students at Queens College. It was shot in the Japanese Gardens section of Brooklyn Botanical Gardens. The photograph appeared two years later on the cover of Roshi's first book, Kung Fu:The Master: The Book of Kitabu. A collection of original poems, the book established the young poet in literary circles but something unplanned by the author also happened. Bob Friedman, then publisher of Donning/Hirschfeld books, had chosen to use the "Kung Fu" poem as the title poem of the book. The collection was originally named, "The Book of Kitabu." The title overpowered the peaceful cover image. The poet soon found himself being challenged at every quarter by Martial artists and streetfighters who were eager to see if he could live up to the title of the book," and by journalists and television hosts, attracted to what the Virginian-Pilot called, "the Kung Fu Poet." In the wake of Bruce Lee's growing fame and public interest in the Martial arts, Kitabu Roshi name became deeply associated with the Martial aspect of his path even though his own conscious desire was to promote the way of peace. Kitabu Roshi made a pledge to God in his youth to defend the weak from abusers but that was a private spiritual oath never meant to be a matter or public knowelege. Kung Fu: The Master changed that. Note that his mudra (hand positioning) is a covered fist, a sign familiar to Martial artists. It is a sign that the individual is a warrior coming in peace. There is an unmistakable Eastern flavor to Kitabu Roshi's path but there is nothing contrived about it. As family members and childhood friends can attest to, it was apparent, even when he was little boy. The call of peace was always the strongest urge in his life. The current state of affairs in the world has moved Roshi to make a slight but significant change in the name of his global mission. The American Vishwa Dharma (Universal Law) Zen Mission will now be known as The American Vishwa Shanti (Universal Peace) Zen Mission. When reading the works of Vernon Kitabu Turner/Roshi or viewing a demonstration it is important to remember his words..."Not I...Not I, I am only the instrument of He who is the source of our being. Of myself, I am nothing." To understand the true nature of The Soul Sword Zen Community, you must look beyond the obvious, beyond the personality associated with it and be a true seeker of Truth. By "Truth," is not meant Religion, Philosophy or even Science. All of these fields of study contain a form of Truth but they are not what Kitabu Roshi refers to here, in and of themselves. "Truth" is what is so, not what is believed or thought. Truth does not need our input or collaboration. It stand alone, perfectly complete and unimpeachable." He says. "Human beings attempt to know themselves through the medium of thought. Most people never figure out that they are living in delusion." "A recent poll claims those who believe in God fall within the ninety percentile rate in America. There is a difference between those who believe there is a God and those who experience Him as a living reallity. People who believe in God speak of His kingdom. There are designated authorities within a kingdom. While it is easy, especially for those born in the Western Hemisphere,to recognize the operation of God within the settings of a church, temple, synagogue, mosque and the like, they tend to overlook His favorite dwelling place...the human soul. There is a limited understanding of God's agencies and agents as they operate in the ordinary world." It has long been understood in Asia that The Light or enlightenment is "transmitted" from Mind to mind and from age to age. Though it may manifest as various individuals it is ONE MIND. Thus, sages, gurus and the like are respected as gateways to realization. How and why this phenomenon takes place or why some people are chosen is unknown. All that is known is that those who possess such understanding recognize that seed in others. Sadguru Sant Keshavadas made it clear that Vernon Kitabu Turner/Roshi is of that unfathomable lineage. He gave him open and public support until his transition in 1997, speaking to him and blessing his mission the very week of his transition. The ONE MIND is unchanging in its nature but the vessels have their own qualities and challenges. Though in the lineage of gurus, Kitabu Roshi prefers to use the more nondescript title, "Roshi," in respect to his initiating teacher, Nomura Roshi. 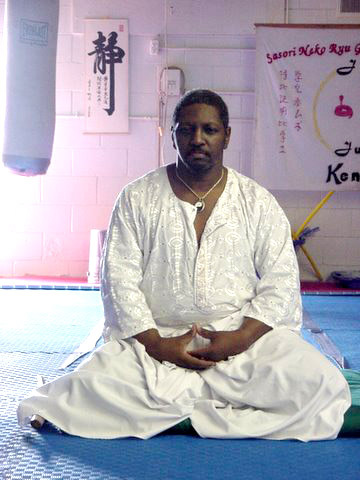 Sant Keshavadas tried to protect the young Kitabu, an African-American guru is a most unespected emissary of The Universal Mind Dharma. For Kitabu Roshi the greatest Zen Koan is how to be what he is in a world that is still locked in on what can be seen. The heart of the guru is fueled by universal love and peace, he is a lover of all souls. In a war where everyone choses sides, The Guru stands between the two shores. Why? Because God commands it.